There's kind of a long story behind my inspiration for this salad. It all began with an entire weekend of eating out with family at restaurants that were not entirely veg friendly. I had to ask for a lot of menu substitutions, which I hate doing. I'm shy about things like that. I have to laugh at myself though because I honestly feel like Sally Albright from When Harry Met Sally sometimes when I'm ordering food. One of the restaurants had nothing I could substitute so I ended up ordering a pear walnut salad and scarfed down about 5 dinner rolls with it. I was starving and carb deprived! ;-) It was really good though! I knew I'd want to make my own, so this is my adaptation. 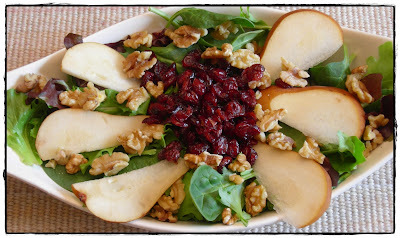 Mix salad and spinach in a bowl. Top with pear slices, walnuts & cranberries. Add balsamic , toss to combine, and enjoy!